The Homepage of the "wandering Wizard"
Upon Entering the Main Hall, You notice the large fireplace in the center of the far wall. The flames dancing, casting a warm glow about the room, illuminating the beautiful paintings hanging about the room. A large picture of a Master with His slave hangs over the oak mantel, as if a symbol of the keeper of the castle. On the wall to the left, between the long narrow heavily draped windows hangs a painting of the Goddess Venus, her long red hair flowing about about her slim body, arms outstretched to the heavens, standing in a large shell, a small cat at her feet. 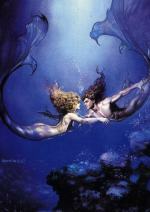 Turning to the right side of the room, you see a painting of a mermaid and a merman reaching for each other under the dark depths of the ocean. 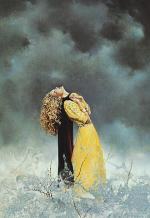 As you turn towards the door, you see the final large painting, seemingly of a slave clasping her cloak, head thrown back in throes of joy, under a darkened sky as if giving thanks to the Gods and Goddesses for her eternal joy. Four smaller paintings hang in a grouping, keeping watch over the room.